Many trails west originated from the Kansas City area, and the rivers that flow through it were the highways for explorers and traders alike. Through the years, Kansas City became home to a variety of unique sights, sounds, and flavors. Jazz music became the heartbeat of the city, and nowhere did it beat louder than at 18th & Vine. 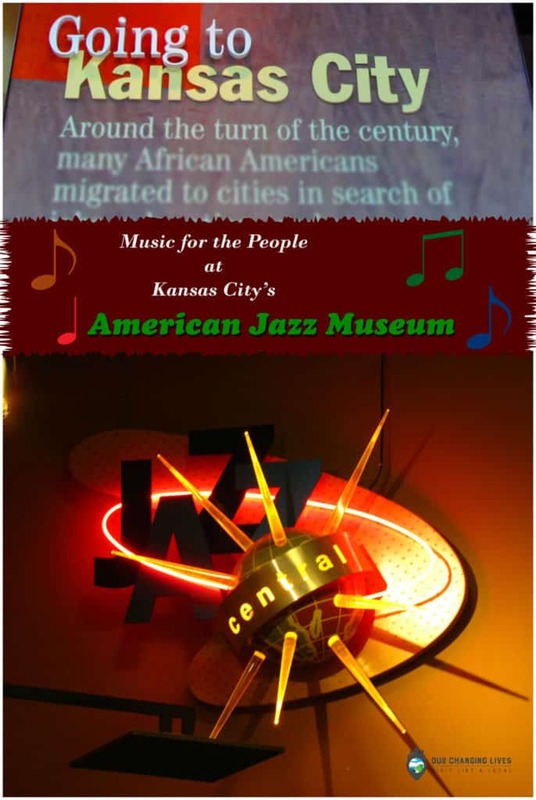 Today, Kansas City is the home to the American Jazz Museum, which is located at 1616 East 18th Street. We made a visit to this iconic site to learn more about the regions musical origins. We want to thank the American Jazz Museum for their hospitality. Rest assured that all opinions are our own. We met up with Marissa Baum, who works with media requests. Our tour started in the rotating exhibit area across from the museum entrance. The current display focuses on the 20th anniversary of the museum’s start. Be sure to check this area out, before heading into the American Jazz Museum. Once we entered the main galleries, our first stop was a small gallery where they have some painted panels on display. These panels were completed by many of the locals, as well as some special guests. The bright colors, and vivid pictures help create a feel for the vibrance of this unique area in the heart of Kansas City. It’s a great place to sit and review. The more you look at them, the more details you discover. The main room of the museum opened before us, as we stepped from the entrance corridor. In this main room, we found a variety of “stations” where various artists are highlighted. In the first section we found areas where you can listen to the sounds of some of the jazz greats. The design is made in a way that guests stand below “sound showers”, where the music rains down on you. While the sounds can travel around the space, it is primarily concentrated on the user at the station. As we listened to the sounds so familiar to Kansas City, we examined the myriad of artifacts on display. Among some of our favorites were Charlie Parker’s saxophone, and a gown worn by Ella Fitzgerald. 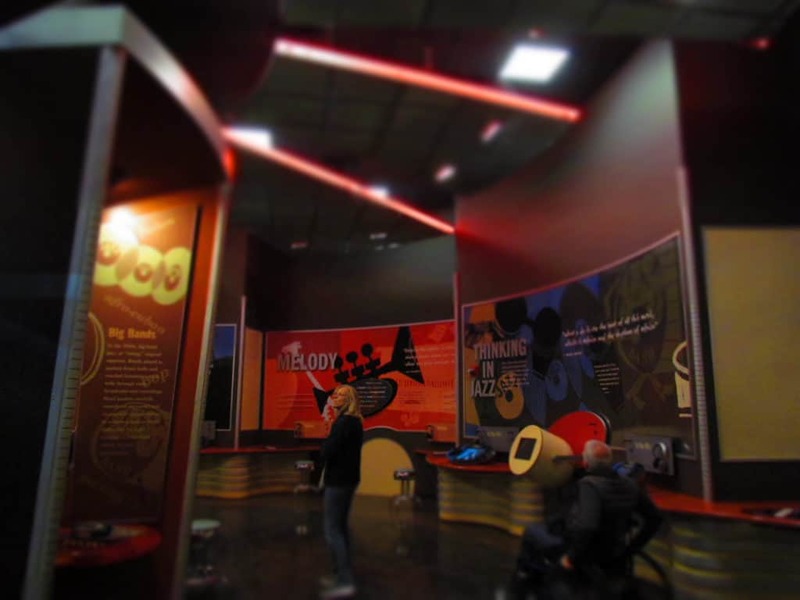 The American Jazz Museum tells the story of the progression of jazz through the decades. As we made our way through the display panels, we learned about the effects of jazz on the community around the region. We also learned about it’s growth in popularity, and how the music spread around the nation. It is amazing to see how this one particular style of music has impacted other genres, as well as the impact it has made in the everyday life of many. Be prepared to spend some time in this area, as the factoids just keep on coming. The next section we explored had additional interactive displays. In this music lab we were able to break down the music to its various components. Where we had been showered with sound in the previous area, here headphones were available to allow us to pinpoint the exact pieces we were examining. Various mixing boards are available to break down the music into its basic parts. This is another area that can occupy a considerable amount of time, especially for those who are musically inclined. Marissa led us into the Blue Room, which is a working jazz nightclub right inside the museum. This was certainly unique to see, since most museums roll up the carpet at the end of the business day. 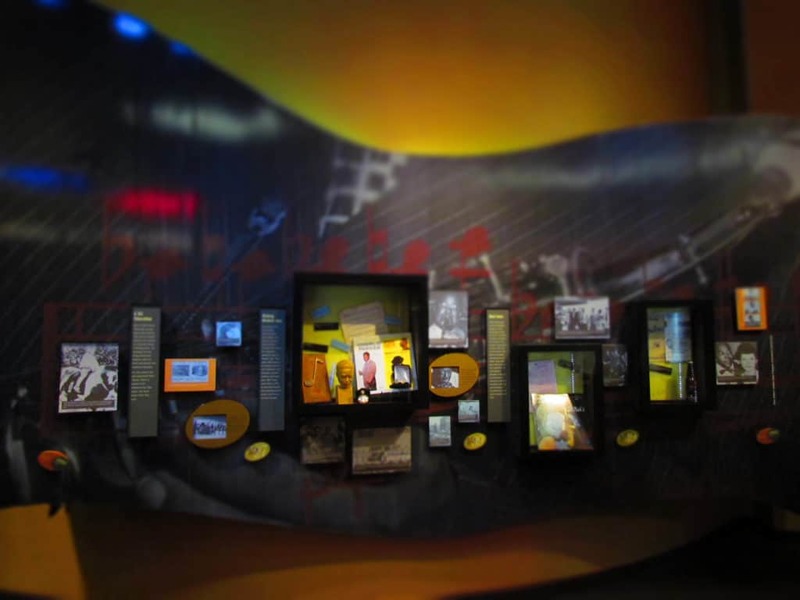 Inside, we found that the walls are decorated with displays of various local jazz musicians. The seating is spread across two levels, and both offer nice views of the stage. As we moved to the lower level, we discovered that the tables are actually miniature time capsules. 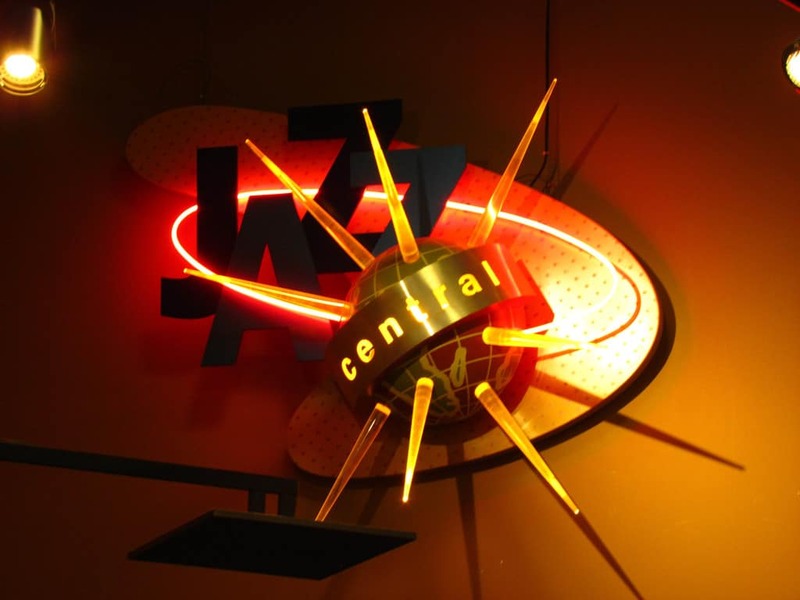 Each table holds a collection of memorabilia specific to the jazz scene. We made note of this for future visits. This would be a good place to bring out of town friends, and this is the perfect seating option to include some unique conversation starters. 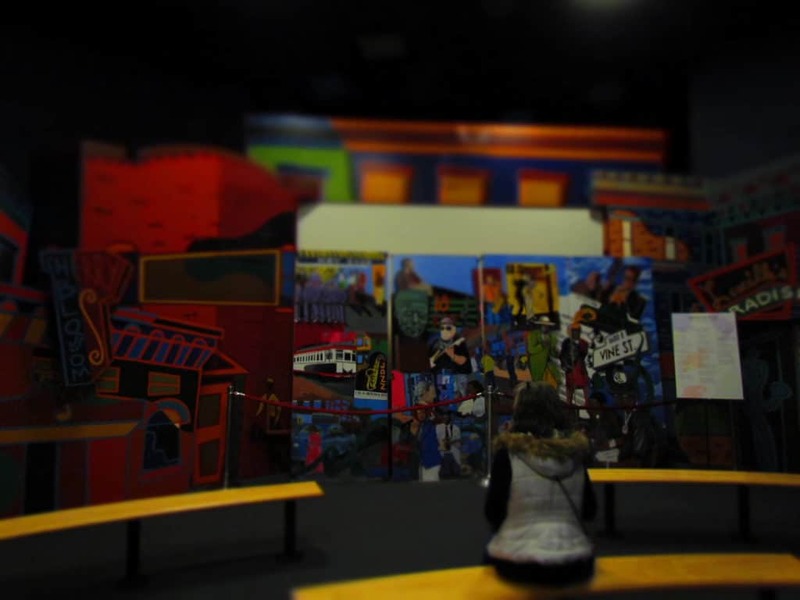 The American Jazz Museum has a prime location in the heart of the Jazz District. The area has been home to a variety of nightclubs and jazz hot spots for decades. A collection of the neon signs hang in honor of the many places that hosted visitors from near and far. It harkens back to the days when the jazz district was the place to be for live entertainment. Did you ever visit any of these places? 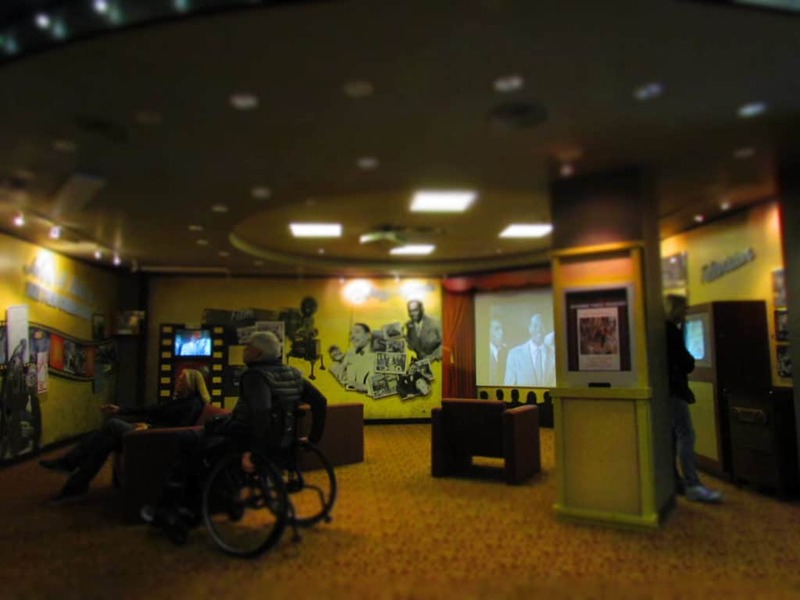 One of the final areas that Marissa showed us, was the in-house theater where guests can view a wide collection of jazz performances. Here we were able to cue up recordings from some of the artists we have heard of for years, as well as some that were new to us. It’s an amazing collection of unforgettable entertainment. The museum is in the process of transferring these historical documents to digital recordings, but this is an expensive undertaking. Their goal is to preserve this ever growing collection in a fashion that can be enjoyed for many generations to come. 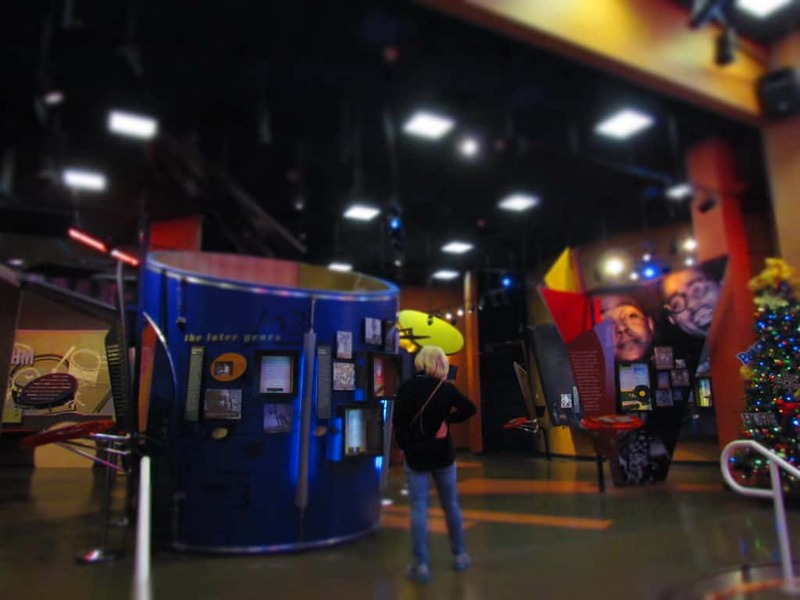 The American Jazz Museum is certainly a treasure of the heartland, and well worth a visit. Be sure to set aside plenty of time to truly enjoy all of the exhibits.